We recently carried out a project which involved installing a brand new long jump run up and sand pit athletics facility at a school in Bridgwater, Somerset. The school wanted a new sports surface which could promote a healthy lifestyle and help the kids to develop their athletics skills. The first part of the long jump run up construction was to prepare the ground by excavating the existing grass field to the area size which the school had specified for the athletics runway surfacing, and installing edgings around the perimeter. We then installed a dynamic stone sub base, this is compiled of angular stone particles which link together to make a stable foundation for the surfacing to be laid onto. The school decided to have Multisport needlepunch synthetic turf installed for the surface of the long jump run up, this fibre bonded woven material is extremely durable and has a layer of sand infill which keeps the pile stable and enhances performance characteristics. The artificial needlepunch surfacing was applied on top of the stone sub base in a bright blue colour by our expert sport surfacing installers. Multisport synthetic turf can also be supplied in other colours and rainbow designs with green, red and yellow to provide a fun and exciting environment for kids. Having this synthetic grass surfacing installed for the long jump run up track is a great alternative to the traditional polymeric rubber athletics material as it can absorb more impact from trips and falls and therefore protects children from injuries when using the facility. Lastly, the long jump sand pit was installed at the end of the run up surface. The landing pit is an essential part of any long jump athletics facility as it provides a soft surface for the athlete to complete their jump, as well as allowing accurate jump scores to be taken in competitions and events. The full long jump run up and sand pit construction process took around a week to complete and the final result was a brand new state of the art athletics facility which enables the students to take part in long jump athletic events. As the needlepunch synthetic turf system is completely porous, the new long jump run up has excellent water drainage qualities meaning it can be used for the kids to practise on all year round and in all weather conditions. As experienced sport surfacing contractors, we appreciate how difficult it can sometimes be for schools to find the time and budget to have one of these great athletics facilities built. This is why offer a service which helps schools in the UK to find the funding to build a completely free long jump runway and sand pit facility. We will assist you through every aspect of the funding application from your initial enquiry to the full construction of the new long jump facility. If you would like any further information about the funding opportunities available, or if you’d like to send us an enquiry for another sports surface, please fill in our contact form with as much detail as you can and we’ll get back to you with some helpful advice. 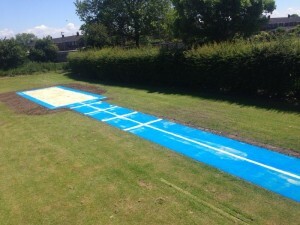 To find out more about long jump run up facilities and any of the other products and services we have to offer, feel free to visit our website at https://www.sportsandsafetysurfaces.co.uk/where you can find loads of information about specifications, construction and maintenance of a whole range of sport surfaces. Was this post helpful to you? Have you ever considered applying for funding to build a sports facility? Let us know your views and ask us any questions in the comments and please don’t forget to share this article with your friends!